Epitope mapping has become more and more vital in both vaccine and antibody drug development. Knowledge on epitope of an antibody will largely facilitate your drug design and patent application. Creative Diagnostics is now able to offer a comprehensive and modular antibody epitope and seromarker profiling service workflow. It ranges from high throughput screening, using thousands of custom peptides, and parallel verification of the peptide hits for hundreds of samples to the validation of results by robust custom peptide ELISA. The assay modules can be combined or utilized individually according to your requirements. Just send your sample to CD together with the sample submission form (see link below) and our experienced scientists will work with you on the optimal screening strategy for your project and help to design the peptide sequences. We will then produce tailored CDStarTM peptide microarrays and/or custom peptide ELISA plates specifically optimized for your requirements and perform screening and control experiments using your samples. The peptide screening platform is compatible with antibodies, sera, whole blood and any other biological fluids that contain antibodies. Subsequent to the assay, CD's biologists and computer scientists will perform data evaluation and analysis. Experiments and results are presented to you as a detailed report. This is a comprehensive epitope mapping service. Just send us your protein/antibody sample and we’ll perform all the necessary functions from sample assay to data analysis. Our Epitope Mapping comprehensive service includes: assistance with your sequence designs, synthesis of a custom epitope mapping – peptide microarray, all on-chip binding reactions, detection of the bound antibody using standard immunological detection techniques, array image scan, and data analysis. We offer additional services for in-depth binding data analysis and curve analysis of quantitative measurements. 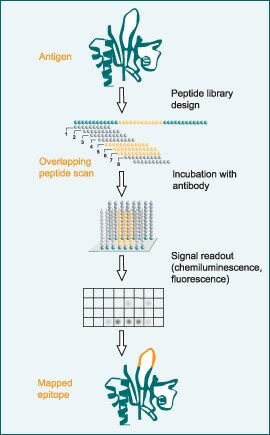 Epitope mapping on a peptide microarray offers the opportunity to study thousands (up to tens of thousands of peptides/chip) of specific binding sequences in a single experiment. One experiment using our 4K epitope mapping – peptide microarray is equivalent to 41 experiments using a 96-well plate. A 30K microarray format is also available. Peptides are synthesized on-chip, not pre-synthesized and spotted. There is no up-front cost to pre-synthesize a peptide library. We can synthesize a completely custom one-of-a-kind peptide microarray specifically for your experiment delivering results that cannot be achieved with an off-the-shelf assay. With the ability to program new sequence designs on the fly, you can quickly revise microarray design and content to keep experiments moving forward based on previous results. Microfluidic epitope mapping – peptide microarrays using our CDStar™ technology produce more uniform spots and enhanced binding kinetics to deliver a more reliable reading of the assay signals. Well-designed positive and negative controls as well as multiple replicates of each peptide sequence contribute to data confidence. Parallel verification of the peptide hits for hundreds of samples by robust custom peptide ELISA was also performed to validate the epitope mapping results.